Yes, these are real SOLID BRASS Mending Plates! Our mending plates contain no pot metal, no plated steel, nothing but 100% solid cartage brass. We custom make these mending plates in our shop to specifications that meet the framing needs of the professional conservator, not the mass market. These mending plates can easily be bent to any needed shape with just two pairs of pliers. The plates are ½" in width, 0.064" in thickness, and are stocked in 2", 3" and 4" lengths. Any custom size is available on special request with quick turn around, call for a quote. The holes are countersunk to accept #3 flat headed screws. To attach the plates, we recommend the use of the following screw: #3 x ½" flat head solid brass wood screw (FH-28120). 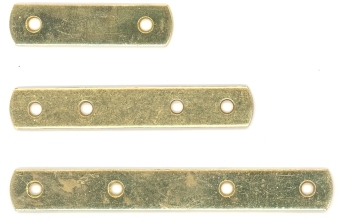 We also offer a cost saving 2" BRASS PLATED Mending Plate. Unlike other brass plated mending plates these ones are easy to bend and will not crack. They are made of a plated metal that will give quite good results after bending. They can easily be bent to any needed shape with just two pairs of pliers. These plates will meet your framing needs at a very economical price. The plates are ½" in width, 0.060" in thickness, and are stocked in 2" lengths. The holes are countersunk to accept #3 flat headed screws. To attach the plates, we recommend the use of the following screw: #3 x ½" flat head solid brass wood screw (FH-28120).